Arrange the lettuce and rocket on the plate. Decorate with pear, walnuts and crumbled cheese. Mix balsamic vinegar, oil, lemon juice and pepper and drizzle over salad. 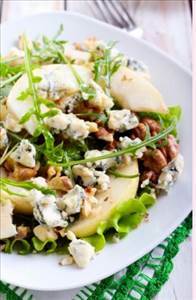 There are 356 calories in 1 serving of Pear, Walnut & Blue Cheese Salad. Calorie Breakdown: 64% fat, 24% carbs, 12% prot.